Just before the outbreak of the Civil War, a handful of landscape painters, instead of painting monumental, dramatic scenes of American wilderness, began painting on a smaller, quieter scale. The Luminist style had much in common with the Transcendentalist writings of Ralph Waldo Emerson and Henry David Thoreau, which advocated that one immerse oneself in nature in order to know oneself and the divine. While the artists did not cohere as a unified movement, they did share stylistic tendencies. Marked by a certain rendering of light as a uniform glow that infuses the entire scene, Luminist paintings reveal no brushstrokes of the artist, thus maintaining a silent, almost impersonal, surface. The particularly American style has continued to influence contemporary landscape painting. While partly influenced by Romanticism, Luminist paintings do not tend to depict nature as grand and imposing, nor do they strive to convey a sense of spectacular, awe-inspiring sublimity. Instead, Luminist paintings with their smaller size evoke a quiet spirituality based on closely observed natural phenomena, especially the quality of light. Luminist light is particularly distinct. It is often cool and hard, almost palpable. The painters use slight tonal modulations, and not brushstrokes, to create the effect of radiant light. Luminist compositions are very ordered, emphasizing the horizontal expanse with a deep spatial recession. The surfaces are precisely rendered, leaving no hint of brushstrokes. This clarity of the picture plane facilitates the viewer's communion with the natural scene presented and lends the scene a certain silence. Luminism refers to a type of American landscape painting that became most prominent in the 1850s and lasted into the 1870s practiced among artists associated with the Hudson River School. The artists did not identify themselves as Luminists, as the term wasn't coined until 1954 when the art historian and director of the Whitney Museum of American Art, John I. H. Baur, used it to describe these naturalistic landscapes, often seascapes or river views, emphasizing the treatment of light to create a contemplative and luminous effect. Baur defined Luminist work as, "a polished and meticulous realism in which there is no sign of brushwork and no trace of impressionism, the atmospheric effects being achieved by infinitely careful gradations of tone, by the most exact study of the relative clarity of near and far objects and by a precise rendering of the variations in texture and color produced by direct or reflected rays." This proto-Luminist landscape depicts the Erie Canal and focuses on the canal's quiet waters reflecting the light of the softly glowing sky. On the tree-lined road along the edge of the canal, two horses are driven by a man on horseback, while at the bend in the low middle distance a boat comes into view around the curve known as King's Bend. The hill on the right is subtly illuminated by sunlight, and a number of ducks swim along the banks of the canal. The painting conveys a feeling of quiet serenity, as the canal takes up the foreground of the painting and draws the viewer's eye toward the low horizon where the small town of Pittsford is visible beneath the autumnal sky, but the town does not disturb the natural configurations of the land. This work employs Harvey's innovative stippling, where he placed tiny points of color adjacent to one another to create an effect of light, a technique that prefigured the Neo-Impressionist technique of Pointillism. The canvas is naturalistically detailed in its depictions of the horses and the boat as well as the seasonal indications such as the crimson leaves on the trees to the left and the bare saplings outlined on the hill to the right. The emphasis on atmospherics, the subject matter focusing on a body of water that reflects the sky and seems to flow into it, and the open composition favoring the curvilinear in its depiction of the canal and the horizon, along with the intimate scale of the canvas, made this prototypical of the Luminist landscapes that would follow over the next 20 years. Mount's Eel Spearing at Setauket is more often classified as a genre painting, but it shares Luminist aspects that others would more fully develop in the following decade. While depicting a common activity, the painting also depicts the still waters that reflect the farmland in the background and the glow of the sky. Despite the action of the figures, there is a quiet and undisturbed mood about the scene that is common of many Luminist works. Sometimes criticized for having a provincial quality, Mount studied at the National Academy of Design in New York, and his awareness of the European art tradition can be seen in his triangular composition and the dignified classicism of his figures. At the same time, his work was informed by the American naïve style's emphasis upon bold outline and simplified elements, as shown in the sharp relief of the two figures. This painting depicts a dugout canoe, bearing two men and a black bear cub, tied to one end, as they descend the Missouri River to St. Louis. The older man on the right wears a Phrygian cap, a French symbol of liberty marking him as a French fur trader, and placing the image within an earlier historical period, when this part of the country was a French territory dominated by the fur trade. The young man, leaning on the cargo in the center of the boat, is the man's son, and his clothing and the beaded medicine pouch near him reflects that he was part Native American. The waters are remarkably still and reflective, as shimmering horizontal lines depict the hidden currents that break around a submerged tree limb in the foreground. In the middle distance to the left, submerged trees rise out of the water, creating a diagonal to the island that frames the two men on the canoe. As a result, the figures come into sharp relief, as the landscape becomes an atmospheric harmony of the river, the hazy distant forest, and the luminous sky, thus creating an examplary Luminist structure. Here, Lane depicts a quiet cove along the coast of Maine where a large sailing vessel lingers at the center right edge of the canvas and a smaller boat lurks in the shadows at the left, almost as if an afterthought. Most prominently, Lane paints the sunset glow in the pink clouds that rise out of the island mountains reflecting in the ocean waters. The sparseness of the scene ensures the dominating effect of the sky and the water. The artist took summer cruises in this area beginning in the late 1840s, and the vastness and wilderness of the landscape became one of his favorite subjects. Like most of his Maine seascapes, this work emphasizes the atmosphere and emotional effect of the coast. With the exception of the boats and a few birds, the landscape is unpopulated, thus heightening the opportunity to be in communion with nature without the distractions of others. Here, one can notice the cragginess of the dead trees in the foreground and further into the scene on the next island. Unlike the Hudson River School painters such as Albert Bierstadt and Frederic Church, Lane eschews dramatic effects, favoring a subtle composition and rhythm as seen in the way the three peaks on the island lead one's gaze to the ship on the horizon. He also adopts an aerial point of view, and his emphasis on subtle tonal gradations, drawn from his experience in printmaking, gives his painting a sense of lyrical restraint. This landscape, depicting the Shrewsbury River, emphasizes the silent expanse of water against a thin curve of the horizon, a line of golden light that barely outlines the cloudless subtle blue variations of the sky. A land formation, covered with vegetation, lines the river, and small sailboats dot the horizon. One buoy punctuates the near center with its bright red, contrasting with the pale blues of Kensett's characteristic palette. Kensett emphasizes a contemplative and poetic experience of nature, grounded in quietism, and to achieve this effect he often minimalized the landscape to its essential elements. He creates an emphasis on line and form that give the landscape a more abstract feeling than one is accustomed to. Kensett was able to create an intimate encounter with nature, where the stillness of the landscape became a way to connect with an inner sense of space and silence. His proto-modern minimalism had a profound effect on the Post-Minimalist Richard Tuttle, who said that the artist's light, which has a self-generating energy about it, influenced his own work. A rugged mountain stands outlined against the horizon and reflected, as if in a mirror, in the glassy lake below. In the lower left, a single figure, a fisherman, can be seen in shadowed profile before a large overhanging rock. The painting's finished reflective surface, as if an image on glass - without any trace of brushstroke, creates an effect of crystalline clarity, while the atmospheric haze above the horizon that cloaks the mountain shimmers with a golden glow. An ardent fisherman Gifford was drawn to spending his summers fishing and painting and perhaps painted himself into the corner of this canvas. Whether or not the figure represents the artist, the solitary individual experiences an intimate encounter with nature in search of the inner knowledge that the Transcendentalists understood nature's light bestows. Gifford, more than other Luminists, followed more closely the styles of Cole and Church in his depictions of the contemplative sublime landscape. This seascape depicts a thunderstorm over Narragansett Bay. Heade emphasizes the impending storm, with the billowing clouds overhead blackening the sky to the right, lit up by a single jagged lightning bolt. Despite the oncoming storm, the water is black, glassy, still, and a number of sailboats on the left and right seem stationary. Two small human figures walk shoreward, away from a docked boat, its white sail in partial collapse. The painting creates a sense of hushed expectation, an ominous pause just before the storm's outbreak, and in the narrow sunlit foreground to the left a cross like shape has fallen over. This painting with its emphasis on subtly shifting perceptions of light and atmospherics within a simplified spatial composition is an iconic work of mature Luminism. The horizontal arrangement of the composition, with two thirds of the picture given to the storm filled sky, results in a minimalistic flatness. Heade's emphasis on stormy atmospherics set his work apart from the more serene views of the other Luminists, though he also eschewed the overly dramatic treatment of the Romanticists. When this work was shown in 1868, a newspaper critic found it "hard and chilling," and, yet, it is this very sense of unflinching observation and flatness that makes the work distinct. In the work's fallen cross and the ship returning to the shore prior to a storm, a common 19th-century metaphor for the course of human life, there is a hint of an allegorical and pessimistic tone. Heade's work seems modern and continues to influence contemporary artists like Keith Jacobshagen, whose oil landscapes on copper plates often depict an intensely lit slice of foreground beneath a darkening sky which fills the picture frame. While Bierstadt is most famous for his large scale, dramatic paintings of the American West, many of his works have much in common with the Luminist style. In The Buffalo Trail, Bierstadt paints the landscape with a low horizon that emphasizes the wide open plains. The light from the sun, shadowed by a cloud, reflects brightly in the river that the buffalo cross. In attempting to picture the West for his East coast patrons, Bierstadt tried to tap into nationalistic feelings that accompanied the 19th-century idea of Manifest Destiny, the idea that America should extend from the Atlantic to the Pacific Oceans. He would travel in the West, making sketches and paintings that he would later use to create monumental paintings back in his New York studio. As curator John Wilmerding remarks, "One reason luminism so suited exploration painting and photography was that it was literally involve in the measurement of landscape." Bierstadt gives the viewer a measured, symmetrical, and harmonious view of nature that draws attention to the center light of the scene, the real subject of the luminist painting. While still nominally a landscape, Heade's painting has much in common with a still life, an unusual subject matter for most Luminists. This painting depicts a close up of an orchid and three hummingbirds framed by an overhanging moss-covered branch with the sun lighting up the clouds behind it. The two birds on the left are Brazilian amethyst-throated hummingbirds, while the bird perched on the branch is a red-tailed comet or Sappho's comet, known for its resplendent tail feathers. The artist uses precise naturalistic detail in his treatment of the orchid's leaves, the veins of its blossoms, and the near translucency of some of the petals that point toward the upper right, drawing the viewer's eye to the atmospheric sky. 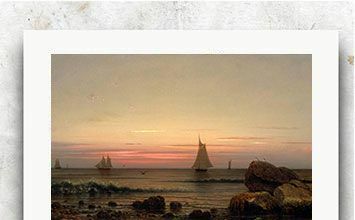 Heade began exploring this new subject matter after various trips to South America beginning in 1863, where he was drawn by the influence of his friend, Frederick Edwin Church. Working on a series called The Gems of Brazil, Heade combined meticulous observation of the natural environment, influenced by the writings of Charles Darwin, with a Luminist landscape to convey a sense of nature's sublime beauty in even its smallest creatures. Cropsey, a figure on the edge of Luminism, depicts Lake Wawayanda in New Jersey, using delicate tones in the treatment of the autumnal foliage on the left shore, the glowing light of the descending sun, and the tranquil lake's subtle reflections. The canvas is divided in half by the horizon, giving equal attention to the lake and the sky, in order to convey a sense of measure and balance. The gentle shapes of the mountains on the horizon, echoed in the closer hills, draw attention back to luminousness of the lake, and the overall effect is pastoral. Cropsey began visiting this area in 1843, and this painting exemplifies his mature Luminist style that conveyed a serene and celebratory mood. For viewers of his time that mood connected with the arrival of the American centennial, of America's having weathered the Civil War era, and of entering a time of economic expansion. At the same time there was nostalgia for pristine landscapes of the past, and, accordingly, the artist leaves out any sign of human habitation and presents the lake as occupied by only a small animal swimming in the middle distance. As a result, his view is a Romantic one, rolling back time to present a somewhat idealized view, though his work was most influential in its using subtle gradations of color to create tonal variation and cohesion. While Luminism generally refers to a style of painting, photographers began using Luminist elements in their photos of nature as they increasingly took their cameras out of the studios. Here, Watkins presents the viewer with a very structured view of a cove on the Columbia River. As in many Luminist paintings, the human presence, if there is any, is very small. Here, a man prepares to go out on the river in his boat but is largely overshadowed by the steep cliffs that loom above him. The river seems remarkably still, and the rock face is reflected on the surface. One realizes that the brightness of the water comes from the mirroring of the washed-out sky above. While the photograph captures a specific moment in a particular place, Watkins' composition, with its emphasis on the reflectivity of the water's surface, plays with the ambiguities of the real world and the reflected world and suggests the need for the quiet contemplation of nature that the Transcendentalists espoused.